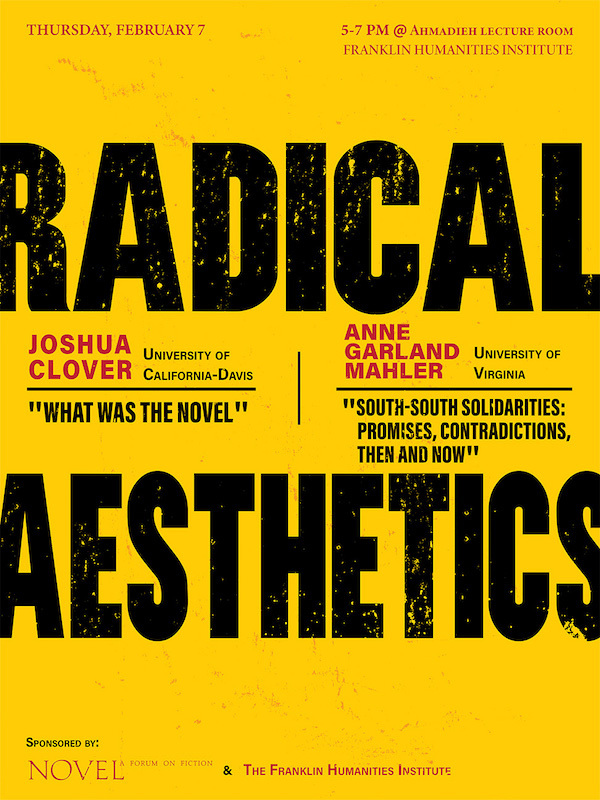 NOVEL is excited host to Radical Aesthetics, a symposium at Duke University featuring talks from Joshua Clover (University of California-Davis) and Anne Garland Mahler (University of Virginia). The event will take place Thursday, February 7 from 5-7 p.m. in the Franklin Humanities Institute's Ahmadieh Lecture Room. “The most perfect example of the modern State,” wrote Marx and Engels, “is North America.” Here in the US, they argued, the idea “that the State exists only for the sake of private property” had become a civil religion, “penetrat[ing] the consciousness of the normal man.” Almost 150 years later, the collapse of the Soviet Union, the most significant communist experiment in human history, signaled the triumph of the American model on a global scale, leading the neoconservative Hegelian philosopher Francis Fukuyama to refer to the final years of the twentieth century as “the end of history.” If the US is indeed responsible for the global capitalism we seem to be stuck with now, then the US should be especially fertile ground for filling out the ideas that Marx and Engels left incomplete. We envision this symposium as a way of testing this proposition. Our speakers have been invited to consider the following questions: What challenges does post-1960s cultural production—sometimes called “postmodernism”—pose for an earlier critique of capitalism? Do we have to rethink Marxist theory for the twenty-first century? Have the aesthetics of the counterculture and the New Left withered away over the last 50 years or have they continued to shape America’s avant-garde art and radical politics? What can we say about the legacy of the “academic Left” fifty years after the student protests in Paris, New York, Mexico City, Prague, and West Germany?